Navy blue wedding Centerpiece Gauze Runner, Cheese cloth table runner, Beach wedding table decor, Destination ceremony aisle backdrop, gift wrap for bridesmaids. 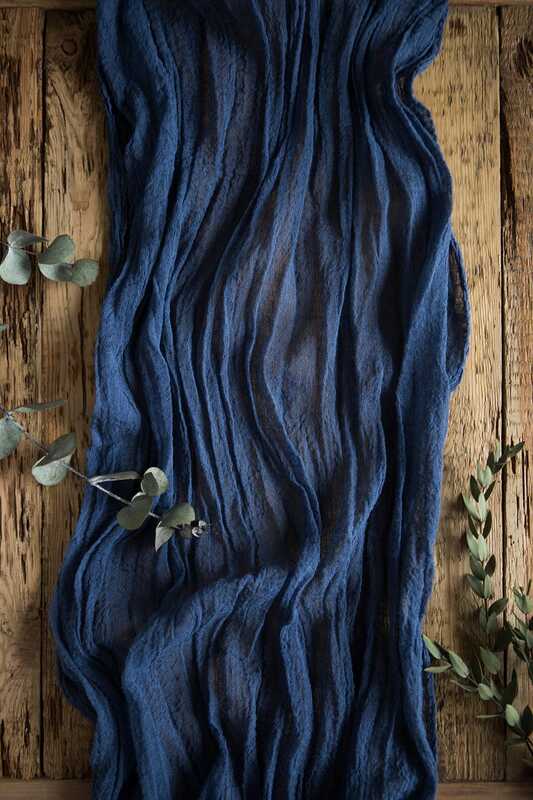 ❃ Give your festive table a rustic-elegant look with this flowy hand dyed gauze table runner. It is unique and elegant for your fairytale wedding table, destination wedding ceremony, bridal shower and party, easter decorations or any occasion. 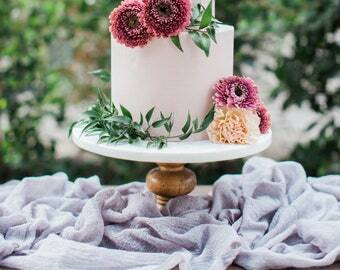 Add this lush cheesecloth table runner to perfectly create a textured accent to your tablescape or centerpiece. 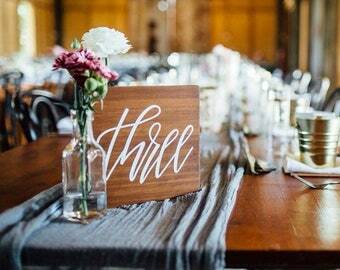 ❃ Table runners allow you to combine your wedding colors in interesting, artistic and unexpected ways. 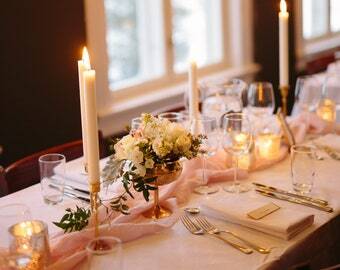 Place flower centerpieces and candles on top of the cheese cloth runner as a decorative touch. Please Choose your size in the drop-down menu. PLEASE NOTE that the colours may look different on your display depending on your settings, this Item is Hand Dyed and may insignificantly vary in colours shade and dye pattern. 💳 Your payment will be accepted through Paypal which takes most major credit cards. You do NOT need a paypal account to process your payment, it merely serves as a payment processor. If you have any questions regarding your payment, don't hesitate to contact me. REALLY great fabric and is exactly as described. I'm using these as table runners for my wedding in Jamaica. Will for sure use this shop again! Everything is so beautiful and exactly as pictured. I’m going to order a few more. Shipping to Canada took just over a month So order with a bit of time but the shipping was very reasonable so no complaints from me! Can you ship via Express delivery - 5 day Service? ➢ We will need to know your full address and phone. In case of express delivery usual shipment time is 3-5 working days. To find out the cost of express delivery, calculate the total length of your runners and order the appropriate delivery in the EXPRESS SHIP section of our store. This is an additional payment to the cost of the standard delivery of your purchase. ➢If your event is less than 4 weeks from now, we recommend booking only guaranteed Express delivery DHL. Usual standard shipment by registered air mail varies depending on country of destination. Usually it is from 2 to 4 weeks. Sometimes faster, sometimes longer. Our appologies, we cannot guarantee this dates since we cannot influence of post companies. Can you shipping into my country? Yes, we can shiping to any country. Normally it takes 2-4 weeks elsewhere. Items are shipped to your ETSY ADDRESS ONLY as soon as your payment is received. Yes, we can make custom orders for any length of runners. But we can not dyed in any color that you send us looking at the photos, since the differences in color through the Internet are very strong, it may not correspond to the desired color in reality. ✂︎ Please, you need to be very careful not to open the package using scissors so as not to cut into the tender fabric. ✍ After you open the package, have a roll of runners and divide them one at a time depending on your order. If you want to give them a smooth airy appearance, iron them with a steam iron and hang out on clothes hangers ready for use. If you need a wrinkled wavy structure - twist them into bundles and leave for 1-2 days before decorating. Can I rent it for my Wedding or Events? No, unfortunately we do not provide it for rent. I purchased the standard shipping options, when will I get my order?